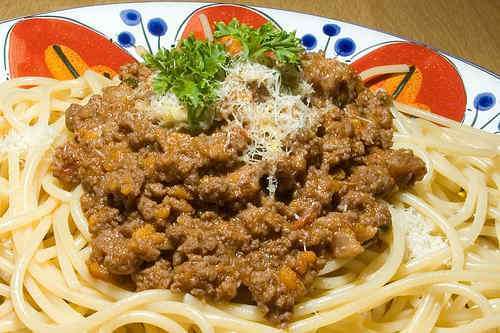 Traditional Bolognese meat sauce needs to simmer for a few hours, not really suitable for a weeknight dinner. In my recipe, I pressure-cook to cut down on the preparation time. I find the result remarkably close to the real thing! Set pressure cooker (at least 5qt / 5l size) over medium-high heat. Add olive oil and onions. Cook until translucent and soft. Add garlic, cook for a minute. Then add meat. Cook while stirring until meat is no longer raw and red. Add chopped carrot and celery. Cook for a few minutes. Add tomatoes, salt and pepper. Put on lid and pressure cook at high pressure for ca. 20 minutes (reduce heat as necessary). Release pressure. Take off lid. Add oregano, rosemary, sage and thyme. Cook until liquid has evaporated. Stir in tomato paste and chopped parsley. Adjust seasoning with salt and pepper. Serve over spaghetti with freshly ground parmesan cheese. Garnish with parsley. I grind the meat myself in the food processor (faster and easier to clean than the meat grinder). Beef chuck is a good choice of cut. With the food processor already out, I also use it to chop onions, carrots and celery. The basic concepts for this recipe are from . Preparation time ca. 1 - 1½ hours.